PONTE VEDRA, FL - On the other end of the telephone line is golf ball diver Norm Spahn. If you didn't know better, you'd swear it was Bill Murray's character from Caddyshack. The words roll out of his mouth with a surfer-like drawl, and you half expect every sentence to end with "dude." The stories don't involve the Dalai Lama, or hitting a 200-yard approach shot with a nine iron, or even receiving complete consciousness on his deathbed. No, they are much better than that. It's a sunny, warm spring afternoon outside of Atlanta, Ga, and the third round of the PGA Tour's Bell South Classic is underway. Sitting just beyond the grandstand on the 18th hole at the Tournament Players Club of Sugarloaf is a small lake. One of the tournament officials decides to park a brand new Dodge Ram pickup truck on the bank, so as not to block a small service road. Only problem is that he leaves the truck in reverse, and not park. Five minutes later, the Dodge is sitting at the bottom of the lake, poised to become the course's most expensive artificial reef. Mike Crawford, Sugarloaf's head superintendent, is momentarily perplexed as to what to do. Then he remembers the chap that spends up to four hours a day in zero-visibility water searching relentlessly for golf balls. By Monday morning, Spahn is at the bottom of the lake, searching through the muck to find a secure place on the truck to tie off the tow chain. "Now that was a tough job because the frame of the truck was up against the hardpan, under two feet of mud," Spahn says. "It was a brand new Dodge Ram truck with 100 miles on it and it was trashed. But they couldn't leave it there and no one else wanted to deal with those diving conditions." For Spahn, it was just another day at the office. 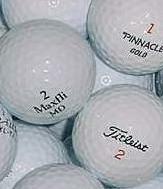 Since an entrepreneurial endeavor went belly up a few years back, the Jacksonville native has been making his living salvaging golf balls from watery graves for the Davis Golf Ball Company. Spahn's territory includes most of the Southeastern U.S., with an emphasis on Florida and Georgia. Half his working life is spent in water you wouldn't wash a stray dog in, much less set foot in. And Spahn's unique vocation hasn't gone unnoticed by superintendents from Naples, Fl. to Duluth, Ga.
"They come by every three months," says Tournament Players Club of Sawgrass superintendent Fred Klauk of Spahn and his co-workers. "I try to get them out Stadium Course on Tuesdays when we are closed for maintenance so we don't disturb play. If I have any problems with any of the irrigation pipes in the water, I can ask Norm for help." Klauk and Crawford are not alone. At Deerfield Lakes Golf Course in Jacksonville, superintendent Bruce Whitson was at a loss as to how to keep one local seasoned citizen from spending up to 30 minutes ball hawking during his round. The golfer, nicknamed "Soupy" for his propensity to spend countless hours trolling for submerged golf balls, was holding up play almost everyday of the week. Finally, Whitson called Spahn into action. "They made up a sign with his nickname, Soupy, and they had me take the sign out into the pond on the end of a pole," Spahn says. "The sign had a glove reaching up from the water holding golf ball and I mounted it in the middle of the pond. The idea was to embarrass this guy so he'd finally stop. I guess it worked." The Big Cypress Golf Club in Lakeland, Fl. is part of Spahn's regular diving circuit. The green on the par three 15th hole is supported by bulkheading in front, and standing on its edge, golfers can peer down at the hundreds of golf balls that didn't quite make it home. The first time he dove the pond on the 15th, Spahn was shocked to find a mess of broken golf ball retrievers stuck in the bottom. After reporting this discovery to the maintenance staff, superintendent Dave Harley became increasingly concerned that some of Big Cypress' older constituents might lose their balance while gawking at all the lost golf balls, fall, and impale themselves on the broken ball retrievers below. Harley called upon Spahn to retrieve the retrievers. "I get down there, and it turns out there are 41 of these things," Spahn says. "It looked like some sort of medieval torture chamber. Its common practice for divers if they find broken bottles to put them on the bank so the next diver won't get cut. But I had never seen anything like this." Its not always as glamorous as Dodge trucks, as gratifying as saving countless golfers from certain death at the hands of broken ball retrievers, or as comical as teaching ole Soupy a lesson. Sometimes Spahn simply lends a hand with repairing broken intake pipes in dank lakes, or pulling pond scum from clogged irrigation lines. Whatever the job, Spahn looks at it as good public relations. "I do that stuff pro bono," he says. "If I can help those guys out, I will. That water is impossible to see in and it's hard to find someone that can dive in blackwater conditions." Spahn says that he has even salvaged a few of his own balls while on the job. A golfer most of his life, Spahn doesn't play as much as he used to because the snail's pace of play on the weekends is too much for him to bear. When he does decide to tee it up, he has both the tools and the venue. Spahn has collected nearly 500 golf clubs while on the job, including a new set of graphite shafted Pings. "And a local Jacksonville municipal course extended me an honorary membership," Spahn says in his oh, by the way manner.